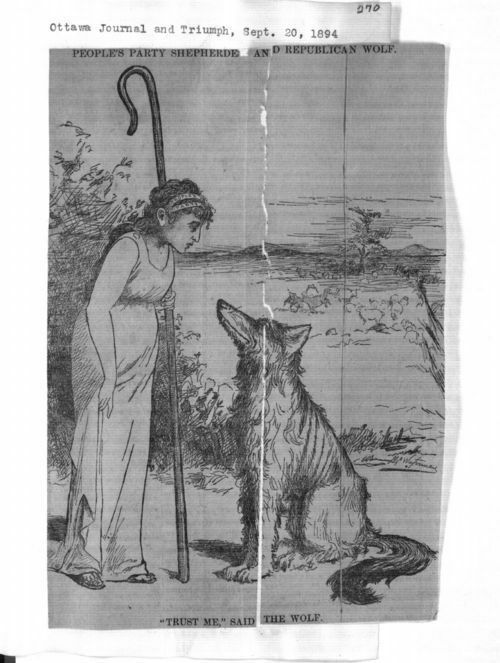 In this political cartoon from the Ottawa Journal and Triumph (printed in Franklin County), the Republican Party is depicted as a greedy wolf, attempting to trick the Populist shepherdess into abandoning her duty as protector of the sheep. The sheep represent the American people. The cartoon includes a caption that outlines their conversation. This cartoon is the only cartoon selected for this standard that illustrates how the Populists did not trust Republican politicians. Thus, it would serve as an excellent introduction to this standard as a visual representation of party conflict during this era.